One of the important drainage-collection pipes is installed near the top of the largest pair of cavities, the maxillary sinuses, located underneath the upper cheeks… Putting the drainage-collection point high within these sinuses is not a good idea because of this pesky thing called gravity. Lents misunderstands the physiology of sinus drainage. The visible opening (ostium) in the maxillary sinus is not the only, or even the main, route of drainage. There is a complex system of interconnection, often at the microscopic level, between the paranasal sinuses, and Lents betrays an ignorance of sinus physiology in asserting that the large visible opening out of the sinus, which is indeed located at the upper wall of the sinus, is the primary physiological route of drainage. In reality, the paranasal sinuses drain by very complex pathways, with many accessory ostia and via several (rather ingenious) interdependent pathways. Furthermore, they don’t drain primarily by “gravity,” as Lents naïvely asserts. Ciliary action moves secretions along to a network of drainage channels. It is perhaps best to think of the large ostium on the upper wall of the sinus as an “overflow” channel, analogous to the overflow opening in your sink. It is not meant to conduct the main flow of fluid in the sinus. In fact, it can’t be the main outflow path, because it is high in the sinus yet the sinus is not often filled with fluid. From design considerations, it can be inferred that a drainage ostium in the floor of the sinus would drain at too high a rate, drying out the sinus mucosa and predisposing to plugging of the ostium by thick debris. More. “Bad design” is, in general, a poor argument against design. A design in nature weighs alternative constraints for a transient life form in a specific, limited environment. It does not weigh an existing design against a Platonic ideal. Life forms in nature are almost always optimally designed but never ideally so. They also feature built-in obsolescence and ecology-friendly weaknesses that limit their population growth. Anyone who designs neighbourhoods, school lunch programs, or traffic routes will be aware of the challenge of optimization. But the concept remains forever a mystery to some. 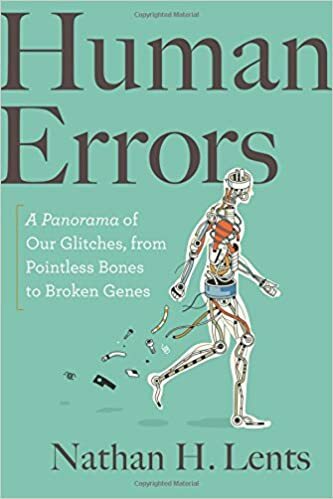 Note:The book is Human Errors: A Panorama of Our Glitches, from Pointless Bones to Broken Genes. External testicles another instance of bad design? Oddly, in making such a dramatic claim (“there is no good reason that sperm development has to work best at lower temperatures”), Lents does not quote any expert on the subject of temperature and sperm development. Furthermore, they don’t drain primarily by “gravity,” as Lents naïvely asserts. Ciliary action moves secretions along to a network of drainage channels. I think Lent’s point is that if the sinuses had been designed and designed better, then the cilia (and the “complex system of interconnection”) wouldn’t be needed. If Egnor thought about it for a moment, he might be able to work out a a design solution to the sinuses draining too quickly. That humans might be able to do a better job of engineering organisms than evolution is utterly laughable Bob. The cilia wouldn’t be needed? They’re always needed. Every hydraulic or pneumatic system in the body, from waste removal in the cells up to the lungs and blood vessels and colon, is constantly active. The driving mechanisms vary from ion pumps to peristalsis to cilia to checkvalves to big mechanical sucker-pumps, but there’s always a driver. Nothing is left to gravity. A passive gravity-based system has to be static, with EVERY channel carefully sloped downward toward the outflow. If the system can tilt in various directions (like a complex animal) it won’t work at all. Even static gravity-based systems, like irrigation channels and city sewers, have pumps and checkvalves at crucial points. polistra – I don’t think the sinuses have much to do with clearing the lungs, blood vessels and colon. Mr Lents seems to be in the camp( like a lot of atheist’s) that thinks, there cannot be a God because he didn’t create the world that “I” would have created, i.e. a perfect world, and will contort themselves into barely imaginable shapes in the process of self justification. Yet another book on how the “experts” would not have designed the human body. “Take an evening out and partake in one of those wonderful choral and orchestra performances taking place all around the world at any given time – I would recommend Handel’s Messiah for this exercise. As you are watching and listing to this amazing musical performance I would like you to notice and watch a number of things very carefully. First the hands – the hands and body motions of the conductor, as well as his facial expressions and body movements as he leads the choir and orchestra through this magnificent musical piece. Continuing with the hands — watch the hands, and in particular the fingers of the orchestra members as they travel across the various instruments – the sting section, the brass section, the woodwinds — the piano. Watch carefully as their hands precisely match the direction given by the conductor. Watch as the fingers subtly, and at times strongly tease the music from their instruments. And note the various musical instruments — envisioned, designed and created by many beautifully designed and created hands and fingers. Next the choral voices – listen as these beautiful voices blend together perfectly with the orchestra, and watch the faces and mouths as they blend perfectly with the hands of the conductor and with the orchestra. Next listen and pay attention to your own reaction as message of the words and music bring excitement and inspiration into your heart and soul. As you leave the concert hall, take time to look at the building and its architecture and artistry. Again, the hands, arms, legs and mind of those artisans designed those arches, paintings and sculptures you admire so much. And when you get back home in bed, ponder over the creation of the musical score of the “Messiah.” Imagine Handel hovering over his desk and the paper taking on lines and musical symbols – and words. Imagine him going back and forth over that manuscript as he goes to and from the scriptures that are inspiring him. Imagine the music that is building inside his head as he creates this masterpiece.